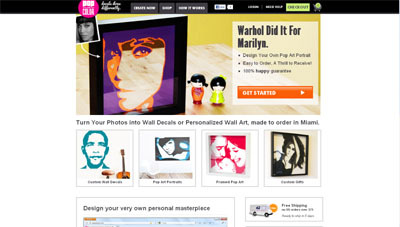 Pop and Color helps you create custom wall decals for the home instantly using your images. Snap a picture, choose size, colors and transform it into a one of a kind decal that you can preview immediately. Forget the cookie cutter home, we make it easy and inexpensive to make your home as unique as you are. There are lots of photo art companies out there that put users’ images on canvas, or wall decal websites that create custom quotes, but there’s never been a service that does what Pop and Color does. Monica got the idea while at an outdoor café, admiring a piece of Miami’s famous mural art on the wall of an adjacent building. She wondered whether there was a company out there that made such an aesthetic accessible to the masses. Extensive research informed her that there wasn’t, and Pop and Color was born.